Need to give your booty a boost? Moringa Green Energy shots are an effective way to replace apathy with a powerful jolt. When your body has everything it needs such as essential amino acids and vitamins, it runs better and inherently has more energy. Moringa is known to be naturally energizing due to its nutrient density and is a natural anti-inflammatory. 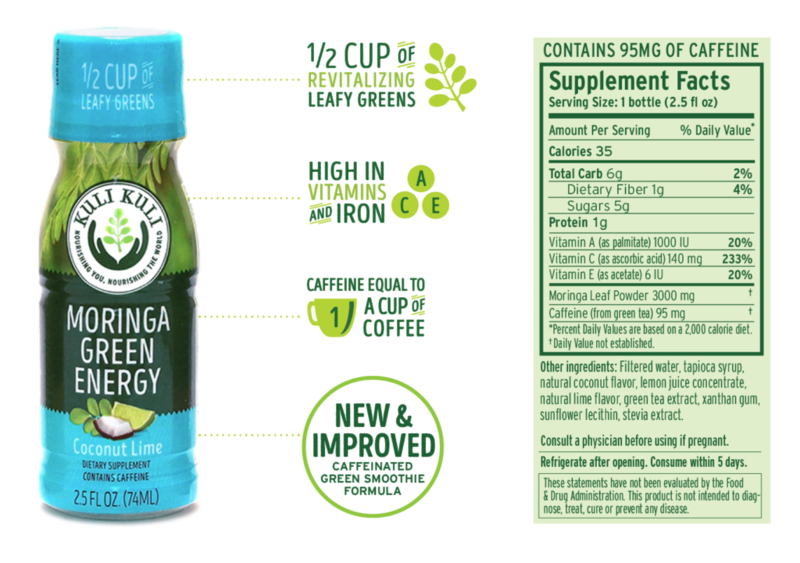 Meet the newly reformulated Kuli Kuli Moringa Green Energy shot. Packed full of vitamins A, C, and E, each shot contains 1/2 a cup of leafy moringa greens and 95mg of caffeine from green tea, about the same caffeine content as a small cup of coffee. The value of Kuli Kuli’s Moringa Green Energy shots lies in its transparency, effectiveness, and social responsibility of this product. 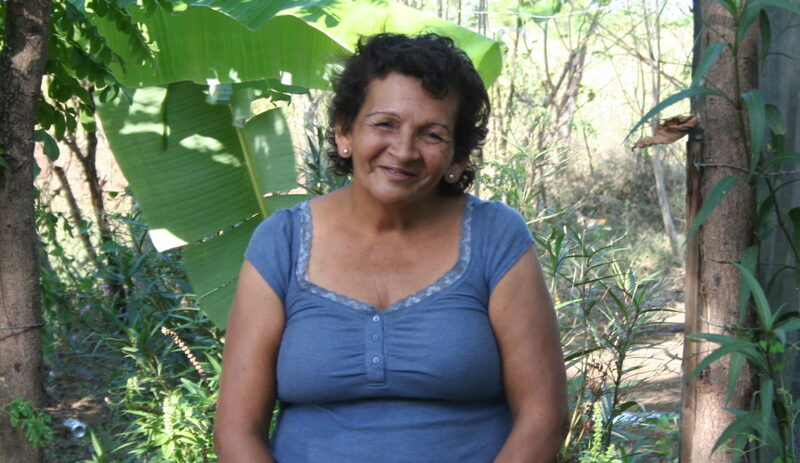 Made with sustainably sourced moringa that supports Haitian farmers and plants more trees, these shots offer a convenient way to get your greens and natural plant-based boost and helps to improve livelihoods around the world. As a small but growing company, Kuli Kuli takes pride in the quality and consumer experience of its products. 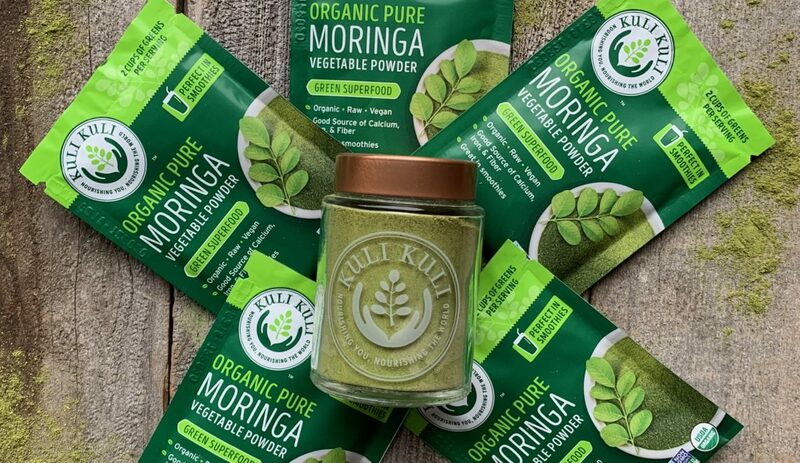 Since Kuli Kuli launched Moringa Green Energy shots into Whole Foods nationwide, Kuli Kuli has received countless praise and feedback. Kuli Kuli took that feedback to heart and improved both the taste and texture of these energizing green smoothie shots. 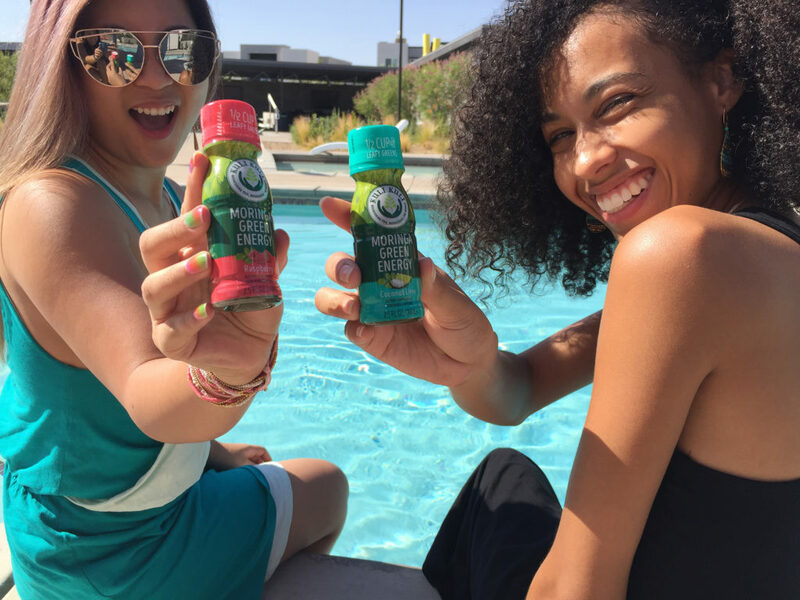 Newly reformulated, Moringa Green Energy shots are tastier than ever with a rich smoothie texture. You can be confident that you will not be ingesting any harmful, questionable ingredients when drinking these shots. Available in a variety of pleasing flavors, including Ginger Lemon, Coconut Lime, and Raspberry. Grab a shot before you hit the gym, start your yoga practice, or head out to blaze a trail. There are a plethora of energy shot brands and options to choose from. We are going to focus on 5 Hour Energy. Because of its popularity and strategic placement, 5 Hour Energy is a worthy comparison against Kuli Kuli’s Moringa Green Energy shots. 5 Hour Energy is currently the most popular energy shot on the market. In just under two ounces, 5 Hour energy promises to give consumers hours of energy, without the dreaded “crash”. 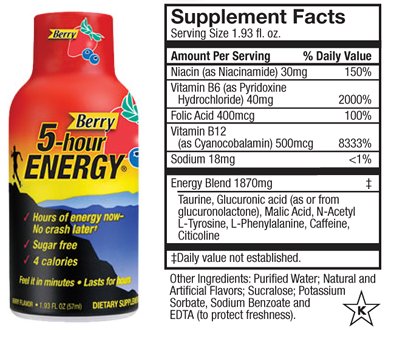 5 Hour Energy is essentially a collection of B vitamins: B3 (niacin), B6, B9 (folic acid), and B12. B vitamins are essential nutrients that our bodies need for good health. They also help the body convert food into glucose, which is used for energy. However, most of these vitamins are present in unnecessarily large amounts (B12 at 8333% daily value!). Furthermore, B vitamins are water soluble which means that the body only takes up what it needs and disposes of the rest. While the excess amount does not pose any adverse affects, there is no additional benefit from consuming copious amounts of B vitamins. * Kuli Kuli sources the caffeine from green tea and not a lengthy chemical cocktail of glucuronic acid, malic acid, phenylalanine, and other words that are jarring and hard to pronounce. ** Kuli Kuli’s sugar source is tapioca syrup and stevia, which are both natural sweeteners. 5 Hour Energy gets its sugar from sucralose, which is an artificial chemical substitute. It is clear that these products have different ingredient profiles to create their energy product. Perhaps what stands out most is what is listed on the labels. 5 Hour Energy warns against children, pregnant or nursing women, and those with a medical condition from using their product. There is also a note that users may experience a Niacin rush, which can include skin redness and heat on the skin. Not a good look. Ultimately, it’s always important to note that a balanced, healthy diet will have much more benefit in the long run towards energy and overall health. While getting a balanced meal in a busy day may have its challenges, you can be comforted to know that grabbing a Moringa Green Energy shot, means a little extra energy and added benefit of moringa-based nutrients in a hectic day. With your moringa energy shot in hand, you may be interested in trying out a new workout. Below is a 100m sprint, a fast twitch muscle workout our blogger-athlete, Melissa has been following recently. For the 100m sprint, sprint 12-16 times at a 15–16 seconds pace. Adjust this depending on your fitness goals. For a 200m jog, be sure to rest and recovery in between each sprint. For more challenging, yet fun track workouts check out these suggestions. Finish off your workout with a Moringa Green Energy! 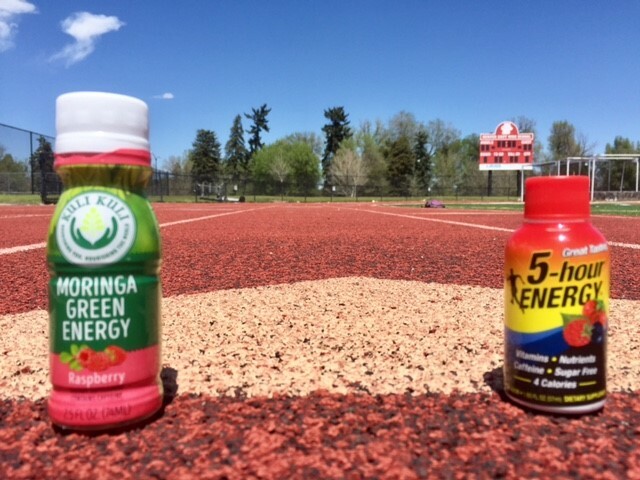 We challenge you to test out both the 5 hour energy and Kuli Kuli Moringa Green Energy at each workout. While you may react differently to each shot, it’s truly about finding what works for your body, identifying your individual sensitivities, and what supports and enhances your biochemical makeup. Be intentional on listening to your body! The key is to reach your peak performance level. 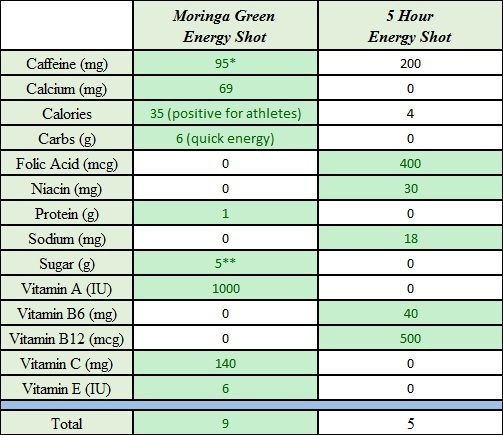 Moringa Green Energy Shots are a delicious, revitalizing, and effective option. But do not take it from us. Test it. Try out other brands, as well. We are very curious to hear about your experiences. 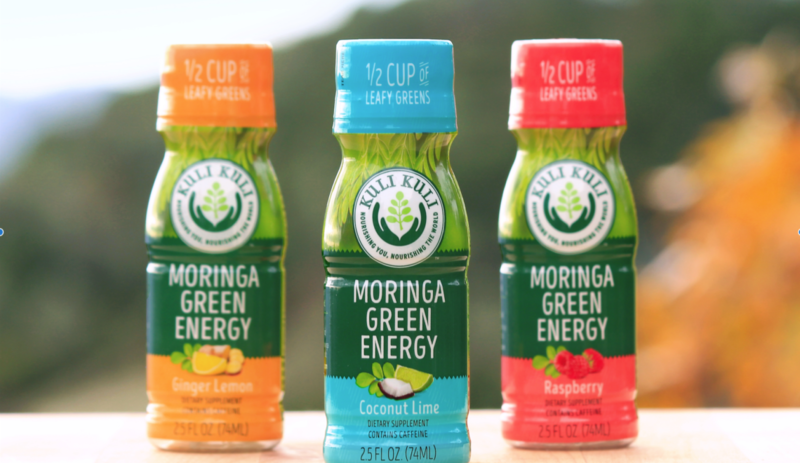 Kuli Kuli Moringa Green Energy shots are a delicious, revitalizing, and effective option to boost your workout. But do not take it from us. Test it. Try out other brands, as well. We are very curious to hear about your experiences!